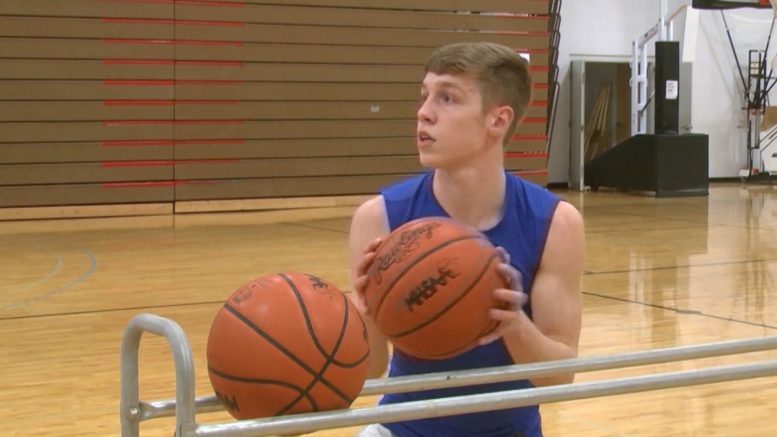 Mio's Drew Hess takes on WBKB's 3-point challenge. Mio, Mich. — Mio’s Drew Hess traveled to East Lansing on Saturday, March 16 for the MHSAA 3-point contest held by the Basketball Coaches Association of Michigan, where he finished first overall. The sophomore took the floor at the Breslin Center at halftime of the Division 1 state championship game for rounds four and five of the annual Top Shooters Challenge. The sophomore faced Kent City junior Eli Carlson. 20 players made up the initial 3-point field. Hess and Carlson made 11 buckets in round four. Then the Thunderbolt knocked down 17 of 25 shots in the fifth round. Carlson only made nine. As a freshman, Hess made 81 3-pointers during the regular season, making the all-time state list for triples in one season. As a sophomore, Hess made 48 3-pointers. WBKB put Hess to the test in Mio, and again he made 17 of 25 3-pointers. Congratulations also to Hale’s Joseph Kimmerer who competed in the free throw competition in East Lansing. Kimmerer finished third overall.